The Texas Department of Licensing and Regulation, which oversaw Saturday’s UFC 166 event inside Toyota Center in Houston, has medically suspended all 26 athletes who performed in arguably the best Octagon show of all time. The majority of the roster was issued precautionary bans, while three fighters are out indefinitely with potentially serious injuries. 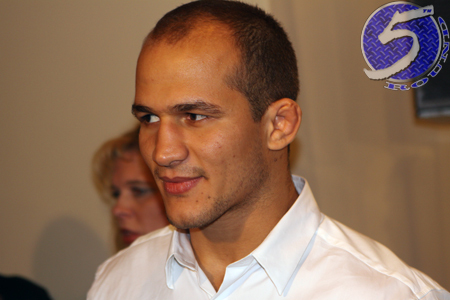 Former heavyweight champion Junior dos Santos (pictured), Shawn Jordan and Tim Boetsch will be riding the pine for an undetermined period of time with their respective war wounds. Although, each can return to action sooner with a doctor’s note. Cain Velasquez, who steamrolled dos Santos for the second time in 10 months, is out until April 18 with a possible broken jaw. However, from the after-party pics that have surfaced on the Internet, the UFC’s 265-pound king had no issues flashing his big Kool-Aid smile all night long. Like the others, he too can come back sooner with clearance.